Whether you stay at Aqua Azur Hotel or you stay somewhere nearby, do not forget to visit one of the best restaurants near the city of Varna - ours. The inner hall is spacious and bright with a capacity of 170 seats. 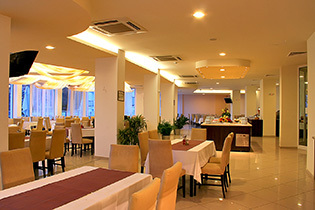 The interior is decorated in soft pastel colors - mainly in shades of yellow and white. Playing with light gives extra peace and comfort, and large windows are overlooking the beautiful park of the Aqua Azur Hotel. The terrace of the restaurant has the capacity of 50 seats. Eating outdoors is visitors’ favourite activity from early spring to late autumn. So they can enjoy a delicious meal, sea air and beautiful views. The menu of perhaps the most preferred restaurants in the Saints Constantine and Helena Resort includes dishes from the Bulgarian and European cuisine prepared with inspiration and artistry.